This was reported by the Vietnam Paper and Pulp Association. According to the association, global pulp prices have increased by an average of 42 percent within a year and will continue to increase. 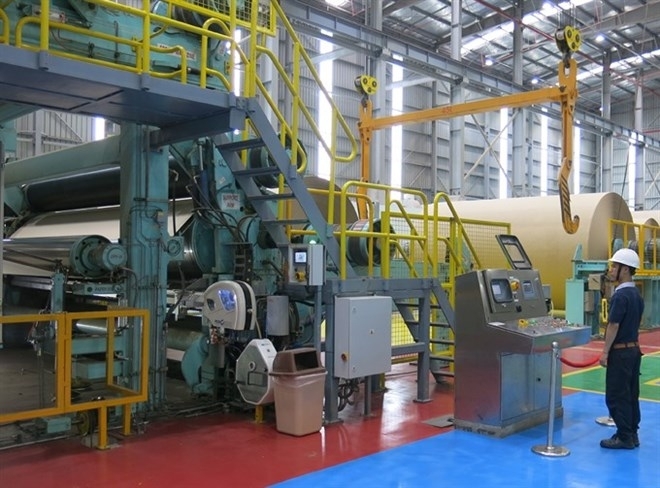 Meanwhile, Vietnam has no large-capacity producers of commercial pulp, said the association, adding that the domestic pulp industry has only met 21.8 percent of the domestic paper production demand. The rest of the demand is met by imported pulp and paper as well as waste paper for domestic paper production. Paper prices in April dipped slightly but were still at a high level. The prices are expected to increase strongly over the coming months, greatly affecting businesses producing paper for books and newspapers, writing paper and photocopy paper. In early May, the price stood at 17.5-18.5 million VND (US$768-812) per tonne for newsprint, up 1.5-2.5 million VND per tonne, and writing paper was priced at some 32.5-24 million VND per tonne, up 4-4.5 million VND per tonne compared with December 2017. Local paper enterprises said from the end of 2017 to date, they have had to compete with Chinese enterprises to buy raw materials for paper production because this industry is restricted in China to ensure the country achieves its goal of environment protection. As a result, businesses predict the prices of imported raw materials and paper to increase in the coming period. In the domestic market, the main production season will coincide with the new school year. In addition, the demand for packaging has also increased due to the growth of the manufacturing sector, creating opportunities for the development of packaging production. According to the Vietnam Packaging Association, the domestic packaging industry has grown rapidly over the last decade. Therefore, the demand for paper is very high. At present, most of these enterprises export wood to other countries and import pulp as a raw material for producing paper. Tran Duc Thinh, Chairman of the Tan Mai Group, said the investment in paper mills is an effort by paper enterprises to localise the paper market, helping local businesses compete with foreign paper makers. However, each business is at a different stage of development in pulp and paper production, depending on their financial capacity. To develop wood for pulp and paper production, the enterprises need support from forestation policy and production technology to ensure a supply of high-quality raw materials and the protection of the environment, he said. Cooperation between farmers and businesses is important for the development of raw material regions in various localities to meet the strong demand for high-quality products. In 2017, Vietnam imported pulp and paper products worth some US$2.5 billion. In the first four months of 2018, the industry produced some 1.18 million tonnes of paper, a year-on-year increase of 60 percent. This was possible because factories have been promoting their production since the fourth quarter of 2017 and have continued to record growth in production since the beginning of this year. Between January and April, the industry imported 465,000 tonnes of paper, a year-on-year surge of 5 percent. The large volume of imported paper was mainly supplied to businesses involved in high-end packaging as well as to the domestic market.